When something doesn't work out the first couple times, it's probably wise to go in a different direction, and just stop being Val Kilmer's personal trainer. 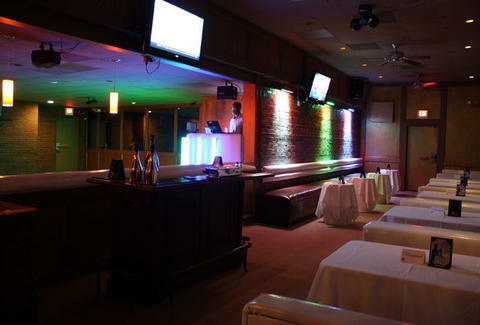 Turning a place that's flopped twice at selling steaks into one where you can dance...and eat steaks...Allure Lounge. Opening tonight, Allure is what's become of defunct steakhouses Norm's and Olde Mill, now part restaurant (thanks to a late-night kitchen serving snacks, steaks & seafood) and part nightclub featuring a new hardwood dance floor, a roped-off VIP section, a croc-skin'd main bar, and a stage with bands performing jazz, reggae, and calypso covers, aka "Day-O", and presumably some other song than "Day-O". Starters include spicy Cajun shrimp skewers, portobellos stuffed w/ crab/cheese/potato, and the steak/chicken/shrimp quesadilla trio; for heavier stuff, get entrees like an 8oz ribeye, a 12oz NY strip, slow-roasted baby back ribs, or twin lobster tails, which've been every man's dream since he first wore a bib. The full bar's got booze, reds, whites, and brews: drafts like Brooklyn Brown Ale and Genesee Cream Ale, plus bottles that run from Negra Modelo & Especial to the rarer Erdinger Hefe-Weizen, which boasts a frothy head and a "golden-straw" color, although that's got nothing on Golden Axe color, which tastes of sweet, sweet skeleton blood. For the grand opening weekend, they'll have random $3 Patron specials Friday night plus tunes from DJ Cowboy, and they're chucking a white party on Sunday featuring DJ Fantastic -- of course he's good, now that he doesn't have to carry the weight for Val.